Latest redrawing - some modifications required. From left to right: new; version three months ago (figure too stocky, shield too Roman); version six months ago. Slowly working towards where I was thirty years ago (some examples). Do they have actual steel? According to the sources, this is what makes them very special: They are armed with steel weapons made by the dwarves of Nida; their swords are irreplaceable, so the regiment has been shrinking over time as individual weapons are lost. It now numbers approximately eight hundred legionaries. Dwarven iron/steel weapons are far superior to anything human blacksmiths can make. I know iron was invented in the Storm Age to fight off elves and trolls, but is steel a refined/treated iron as it is in the real world, or a different material altogether? Was it invented at the same time or later? Sorry if this is too much of an aside. My (probably non-canonical) assumption is that steel is highly refined (and attuned) iron, subject to secret processes involving heating the iron using charcoal as part of the rituals. Historically, terrestrial iron and steel weapons were of very great variability - the worst iron swords weren't as good as a bronze sword - but very early on methods of creating steel, or at least creating a partially steel sword were known, or at least achieved, often using pattern welding. This required laborious and skilled processes, and probably contributed to the mystique of the smith. Basically any piece of iron that has undergone smithing or milling can be considered steel. Even a piece of de-carbonized iron gets re-carbonized when smithed in a charcoal or coke fire. Warning: three paragraphs of real world chemistry following. There is (quite hard to refine with pre-industrial methods) pure and soft iron, and then there is carbon steel, containing a certain amount of Cementite (Fe3C) crystallites, a metallic carbide significantly increasing hardness, which is the normal product of smelting iron with coal. As long as a piece of iron contains a small portion of carbon and has undergone a smithing (or milling) process, it is considered steel, an alloy. Carbon steel has up to 2.1 % carbon, which means up to 30% cementite crystallites. What may be confusing here is that the carbon doesn't come as an elemental form in the steel, but as an iron compound. Carbides come in three forms - covalently bound (e.g. silicon carbide, a popular abrasive for its hardness), metallic (as with iron and similar transition metals) and ionic (forming acetylene upon contact with water, like sodium carbide). Metallic carbides act like elemental metals or metal-metal compounds like e.g. the two phases of real world brass which have different Zn/Cu ratios. I have no idea whether any of this has any meaningful application in Glorantha. We only know iron as ingots (a trade good, usually from Belskos in Seshnela) or as finished pieces produced by iron dwarves or Third Eye Blue smiths. The means of extracting iron from whichever mother stone (aka ore) is used may involve heat and coal, but not necessarily. It is at least as likely that the Mostali use magical energies in a process similar to electrolysis, separating out anything which is not Separation. 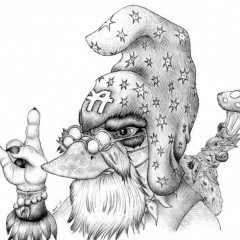 We know from the Capstan illustration that they employ energy leads overseen by silver mostali to power magical processes, and there is a high likelihood that making iron is one of those processes. Third Eye Blue smiths might use a similar magic, possibly a variation of Tapping out the impurities. The smithing will usually still require coal for heating - whether charcoal or coke refined from rock coal (see the Caladra and Aurelion cult for data on rock coal). Heated pitch or tar might serve as a fuel with sufficient aeration, too, and let's not totally exclude using hot magma pools for heat quenching of smithed items. I don't expect there to be great amounts of iron dwarf skeletons available for smithing, unless the mostali breed a lot of them in excess and dismember them in rigorous elimination training. There is something scary about facing an army of magical smiths who wear the processed body parts of siblings they killed in training. If there are Mostali enclaves using this Growth method to access their iron, they will have highly damascened smithed bones to work with. But I seriously doubt that this method was employed in Belskan in Seshnela, or the God Learners would never have managed to conquer the place. Also, I don''t see Mostali trading away their highest quality goods. Occasionally lending them out, like Isidilian does, if they are very Openhandist. I do wonder what was the price of the swords, or when the Empire acquired them. Geography suggests they got there pre-Syndics Ban, post Bindle Wars, when Charg still was a known hazard barbarian-infested place like Brolia. Bbut that would mean that they either never saw action against Sheng in those disastrous battles kiling Takenegi (but then why are they a bodyguard unit), or that the legion had about Roman legion strength to begin with. Even if there was recruitment of sufficiently heroic warriors who went and returned a weapon conquered by one of Sheng's Lieutenants or otherwise favored recipient of this kind of plunder. Of course, Sheng lost in the end, and so a certain amount of lost swords might have been reclaimed early in the Fifth Wane, but then came the Night of Horrors, which left a battlefield one cannot plunder. That battle didn't feature the then current mask of the Emperor, though, so the legion may have been legitimately absent from that disaster. It might be possible to list the Lunar units in a table with battles and campaigns and the outcomes for the units, but that would probably be a project half the size of Martin's book. The price for the steel swords would probably have been several times their weight in moon rock, as I see little else the Empire could produce that the Nidan anti-Openhandists would value enough to part with that much iron, and hardly any way even the Crimson Bat could have created enough of a threat to force them to comply. Since we're talking about swords [and I admit that I haven't read 16 pages of discussion] what about the Iberian /Carthaginian falcata? 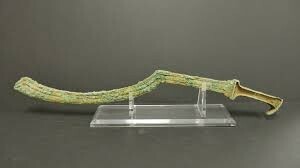 Or the classic Egyptian khopesh? And sadly mostly irrelevant for the real world production of Iron Age swords, where techniques were used to overcome the imprecise quality of steel incorporated into iron swords because there was no way even a highly skilled smith could determine accurately the chemical composition of their iron as they forged it. Iron in Glorantha is either obtained by trade with the dwarves or in locations where Iron Dwarves or iron constructs died in great numbers, and the latter can be mined but invariably is finite, with the mine being exhausted. I do wonder what was the price of the swords, or when the Empire acquired them. The Steel Sword Legion dates back to Second Age Fronela. The regiment entered Lunar service after the defeat of the Carmanian Empire. The falcata is almost identical to varieties of kopis - even the name of the falcata is a 'modern' 19th century invention. They share very similar characteristics, and it is unknown if they are the outcome of parallel 'evolution' in the western and eastern Mediterranean at around the same time, or were introduced from one to the other. In Glorantha, the kopis was introduced to Peloria by the Pentan nomads, and is now one of the most popular sword types there. The khopesh is certainly present as well, as a variety of the Lunar 'sickle' swords, some of which look like sickles and some don't. 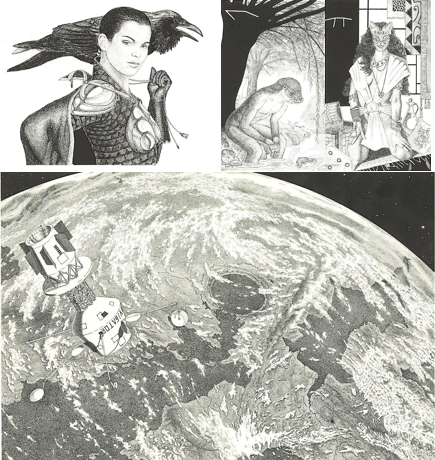 Reread the Wayland saga on iron age metal processing, through symbolism. The impurities you are talking about aren't carbon, but phosphorous or sulphur that contribute negatively to both ductility and hardness. The chemistry doesn't change whether you know content ratios or not, but the distinction between iron blades and steel blades is simply nonsensical. If it is forged, it has become steel. The ironsmiths of the Noricum produced reliable quality in mass production, providing a steady stream of nearly normed forged steel blades to the Roman legions. There is a significant portion of recycled iron from former items that got damaged or just repurposed while their owners perished. Is the Third Eye Blue possession of the iron secret post-canonical now? Interesting. But still the question - how did they get from all the possibilities the Nidan dwarves to forge the blades for them, the most xenophobic lot of dwarves west of the Wastes? If they ended up in Carmania, they must have been part of Syrantir's 10,000 (or however many fighters may have followed them), which means they couldn't have used God Learner secrets to force the Nidan decamony to do their bidding. 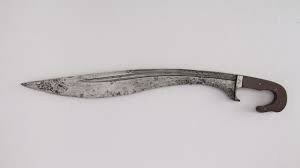 Okay, looking up 'Greek kopis', I see the similarity. I'd seen other illustrations that looked very like a sword-axe [a' la the '300' movie]. Certainly they existed in history, but I have to admit that I never liked the visual of them. They have this ridiculous 'mall ninja' look that bothers me. But then, I fought as a heavy in the SCA for many years and I freely admit to a straight blade bias. From my experience looking over the shield rim at bad guys, there isn't a whole lot to recommend a curved blade while fighting on foot. It's true that a kopis /falcata can be a shield killer with enough *oomph* behind it, but it doesn't really lend itself to any combat style other than the overhand hack. The same goes for the Lunar sickle swords of whatever variety... especially when you imagine them a legionary type formation. Cohortal or manipular formations depended on the front ranks being able to stab underneath into the abdomen of opponents who were hacking overhand and using their shield to counterbalance the motion of the strike. But at the end of the day, this is fantasy with Gods and demons and magic that works. If Greg and Steve say that cohorts work with scimitars, so be it. Given the relatively few Roman swords that survived into the archaeological record, and the lack of marks to indicate where they were forged, it isn't possible to make such sweeping generalizations. Many Roman (and Etruscan, Greek etc.) swords were of relatively high quality, but that's due to how the swords were manufactured (such as pattern welding). The TEB can work iron (blacksmithing is a very rare skill in Glorantha) but I am not aware that they could ever manufacture iron. In the real world, kopis swords were very popular 'chopping' swords and Xenophon recommends them for use from horseback. 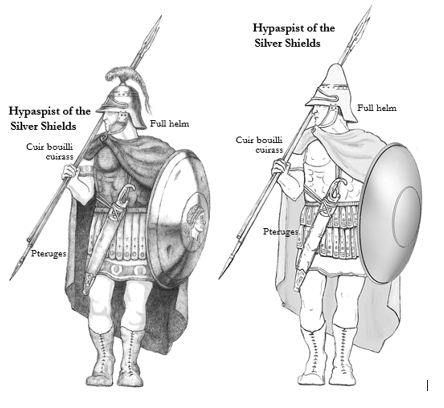 For infantry, the straight xiphos was more popular, based upon depictions on pottery etc. and a short thrusting weapon would be more versatile and useful in a phalanx if your spear had broken. As for '300' - arrrghhhh! Awful movie. I know. 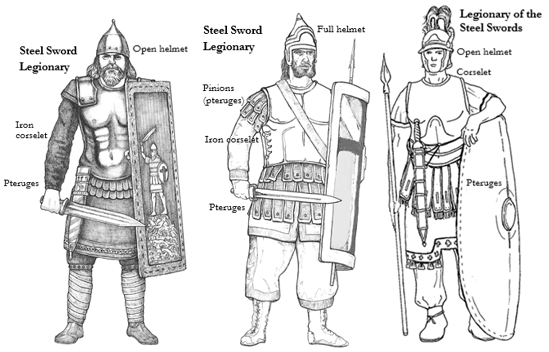 There are Legions in Glorantha, but they aren't Roman legions with their formations. I suspect that many Lunar units (but not all) carry kopis due to the mythological/ideological requirement for a curved blade. Haven't been able to work out exactly how they fight with them in close order combat. Interesting statement in the face of too brittle iron with too high carbon content. Paracelsus' famous quote that the poison is made up by the (proportional) amount of a substance applies to metallurgy as well. Chemical comparison to slags containing the oxidized crust of such pieces can do similar wonders as isotopic analysis of teeth. You're obviously not thinking like a chemist, or an archaeologist using chemical fingerprints to correlate worked pieces of metal with workplaces. But I will admit that there have been no complete surveys of the catalogued finds by this criteria, as lab cost for such procedures easily break the budgets of most archaeological institutes. Many Roman (and Etruscan, Greek etc.) swords were of relatively high quality, but that's due to how the swords were manufactored (such as pattern welding). Etruscan steel appears to have been of fairly constant quality, too, judging from the relative uniformity of the slag in several meters thick deposits. I'll admit almost complete ignorance about Greek ironworking and its correlation to geography and geology, however. Sure, combining rods of iron with known (experienced) differences in qualities like ductility and hardness (which correlates to carbon content) is a pretty good method to guarantee an overall quality, unless the only ore you have happens to be bog iron. Better than no iron at all, but probably some of the worst basic material for making steel. 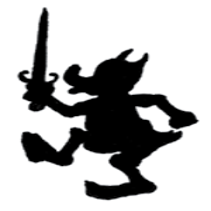 When I first encountered them in my initial research of Glorantha (as a people in Genertela Book, not as the individual Piku Dostupiku at Gringlestead), the secret of making rather than just working iron was their selling point. There is no indication that Piku ever produced iron from non-metallic sources, but he is a single fully trained metallurgist in the diaspora. If Blacksmithing is so extremely rare, all blacksmiths must be in the employ of cults, given the relative ease with which cults can provide iron implements for damaging people and monsters. Well, the Marian legion [based on cohorts] is a much looser formation as compared to the phalanx or the Saxon/Viking shield wall. One look at the legionary scuta after Gaius Marius professionalized the legions will show you that they weren't made to overlap in battle formation until deep in the AD's [about the time they were strapping iron darts on the inside of their shields]. I suppose a Lunar legion-equivalent could use a sickle-sword of some form to stab upwards in a softball-pitch motion.... But again, I wouldn't recommend it. Steel requires carbon... If the carbon content is too low or too high, then the resulting material is unsuitable for sword making. This is why from very early on, smiths used pattern welding to obtain an 'average' that wasn't too high or too high - and even then the sword might prove unsuitable. You're obviously not thinking like a chemist, or an archaeologist using chemical fingerprints to correlate worked pieces of metal with workplaces. But I will admit that there have been no complete surveys of the catalogued finds by this criteria, as lab cost for such procedures easily break the budgets of most archaeological institutes. Thank you for this admission. Sadly, there are times when digging too far into Glorantha often results in destroying it, much as that adventurer Schliemann severely damaged the site of Troy digging right through the level he wanted, and in the process made an enormous trench wrecking the archaeology of the site for all time. Carmanian bronze-working is considered amongst the best in Genertela, thanks to the Third Eye Blue smiths and the dwarf slaves of the City of Brass. A tribe of sorcerous metal-workers, called the Third Eye Blue people, inhabit these mountains. They claim to have stolen the metallurgical secrets of the dwarves and to have ruled a great empire in Fronela. Sadly, there are times when digging too far into Glorantha is often results in destroying it, much as that adventurer and con man Schliemann severely damaged the site of Troy digging right through the level he wanted, and in the process made an enormous trench wrecking the archaeology of the site for all time. And you can say that about any franchise or genre. Sometimes you just have to let the magic be magic and the warp drive work because the author says so. 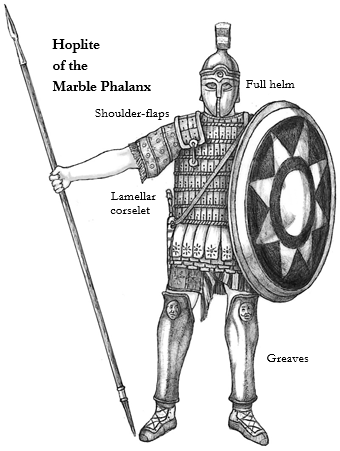 Most Lunar, Pelandan and Dara Happan heavy infantry regiments fight in phalanxes, albeit more like the Macedonian than the Classical Greek in that they are divided into 'companies' and are not a civilian militia (though only Sun Dome Templars fight as phalangites); Provincial regiments fight either as phalanxes or shield walls. I suspect that those carrying kopis swords only use them either when their primary weapon is broken, perhaps when their formation is broken when fighting becomes a general free-for-all, and perhaps when engaged in activities when their primary weapons aren't suitable. And even then, if 'kopis' is listed as their secondary weapon, I'd hazard that most also carry a long dagger, not only as the original multitool, but to be used in the press of a phalanx or shield wall when they main weapon is broken or lost. 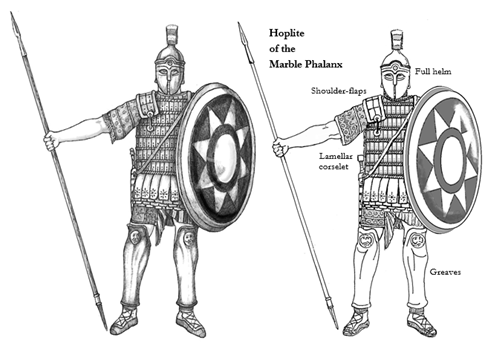 Roman warfare post their use of equivalents of phalanxes or shield-walls doesn't seem to map very well onto Gloranthan warfare, with the possible exception of Humakti heavy infantry who are equipped with a throwing spear and sword. But even then, they aren't in cohorts or triplex acies. In Apple Lane and Return to Apple Lane, Piku the smith can work iron (and other metals). From what I can tell, the Cinsina get pre-worked iron from the Dwarves to help in their battles against the Telmori, so it's not clear if they have their own blacksmiths. Can Willandring the Giant work iron? In Storm Tribe (now non-canon but very useful IMO) the Humakt subcult of Inginew can work iron and the cult of Babeestor Gor can, at the very least, enchant it. Huh? The glow of any real world material at a given temperature has the same color. The difference between iron and bronze is that iron remains solid at much higher temperatures, hence iron implements can glow at much whiter colors than the dull orange you get from molten bronze. Pottery is no different from iron in this color play, so if you fire up a pottery kiln and want to see if you have reached the right temperature, you judge it by the color. For fine temperature measurements, you add salt mixes in cones, whose melting will show you that your glazing is going to be molten now. Glass blowers usually have a very good tan when working with high melting point material because of the almost solar glare of the material before their faces. I do wonder whether synchronizing magic could make Gloranthan military units a lot more mobile than their ancient world parallels, even beyond the degree of Roman legions or Swiss phalanxes. After all, Polaris is master of the dance, and turning on the spot is his special move. The magical about-turn of a formation might even be an exhilarating experience with centripetal force like many folk dances where some of the dancers (usually the girls) get lifted off the ground by the circular motion of others. Well, let me point out that working raw iron into sharp blades isn't all that much more sophisticated than working copper. The Xhosa and Bantu peoples of Southern Africa [the Zulus are a Bantu people] were able to make assegai blades using stone anvils and hammers. There's nothing that says the Mostali don't trade blade blanks for the locals to pound into specific shape. Huh? The glow of any real world material at a given temperature has the same color. Iron needs to be heated to different temperatures to be suitable for particular uses. I'm sure that's in Weyland the Smith. The manufacture of bronze and iron swords is very different; you could make an iron sword in the same way as a bronze sword, but I wouldn't bet your life on it in combat. Very likely. However, there's a significant technological gap between a basic fairly short spear blade and a sword sufficiently resilient to be used in combat for any length of time.